One of the holy places on the land of golden beaches, Orissa, Puri is known as Jaganath Dham or the seat of Lord Jaganath, a synonym of Lord Krishna. It is one of the four most vital Hindu pilgrimage centres, the other three being Badrinath, Dwarka and Rameshwaram. Location : Located to the eastern part of Orissa, 60 km from the state capital, Bhubaneshwar and 35 km from Konark. Climate : The climate is tropical with high temperatures during April-May and pleasant winters. Climate soothes due to the influence of Bay of Bengal to its east. 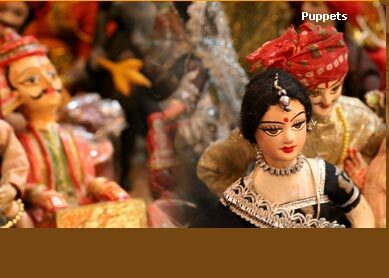 Known For : The Jaganath temple, The Rath Yatra or Chariot Festival, Puri beach. Best Time for Visit : October to April. Jaganath Temple : The 12th century temple on the Bay of Bengal shores, is the tallest and one of the most renowned temples of India where devotees line up in thousands every year to have the glimpse of Hindu Lord Jaganath, Goddess Subhadra and Lord Balbhadra, to purify their souls. It is believed that Lord Jaganath appeared in King Indradyumna's dreams and asked him to build the temple. The walls and pillars of the temple are exquisitely carved with paintings portraying Lord Krishna. The famous Rath Yatra starts from this temple. Gundicha Ghar : This temple, founded in the 16th century, is located on the north-easten side of the main temple of Lord Jaganath. 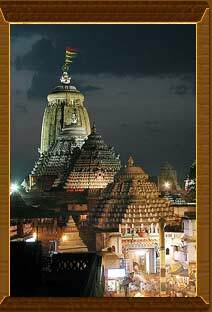 The ornate temple is named after King Indradyumna who built the temple of Lord Jaganath. It is revered as the temple of Lord Jaganath's aunt who welcomes the Lord in her house for a seven-day stay during the Rath Yatra. Atharnala Bridge : An ancient bridge of the 13th century, it is an architectural marvel of that time when people had put all their skills and efforts to bridge distances and promote trade and communication. It can be an important destination to study the architecural expertise of that era. Ashrams And Maths :Puri maths are the ultimate alcoves to visit if you are in the mood to explore the age old Hindu religion. The most famous of the Maths here are the Jaganath Ballav Math and the Suna Goveardhan Math. Rath Yatra :The most famed festival of the city, the Rath Yatra or the Chariot Festival, is the grand representation of the cultural and religious traditions that paint the city with extra vigor and vibrancy. The festival extends to more than a weak with idols of Shri Jaganath, Subhadhra and Balbhadra are taken in separate chariots, from Shri Mandir to Gundicha temple where the idols rest for seven days and then are taken back to the Shri Mandira in a similar procession with full grandiose. It is believed auspicious to serve the Lord on this day by pulling his Chariot's ropes and taking a glimpse of the idols. Beach Festival : Hotel and Restaurant Association of Orissa (HRAO) and Ministry of Tourism conduct this four day-long festival every year during March/April, which is enthusiastically waited for by tourists and locals. 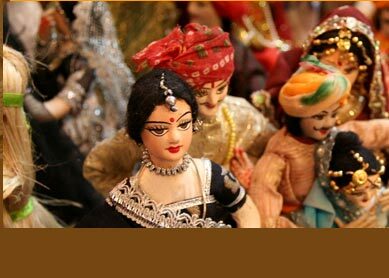 The festival jives up the subtle beach with displays of various handicrafts showing the deftness of the locals, vibrant shows and cultural performances that goes well with the sounds of the waves. Nava Kalebara :The ceremony marks carving new idols of the deities-Jaganath along with his brother Balabhadra and sister Subhadra, and replacing them with the old ones following the century old tradition..
Puri Beach : The best beech on the eastern coast of the country facing the Bay of Bengal waters and marked by white sand is the most navigated recreational spots of the area, One can enjoy tender coconut water, sip an authentic tea or stroll against the winds watching the feet get pure as the waters wash it in the divine city. Resembling the vibrant colors and intricateness of the city, every piece of work that you see here is ethereal, the mirrors and threads do the talking and you are left amazed and wishing to shell out your pockets. The flashy dazzling mirrorwork on the traditional wear, shimmering decorative items, multi hued paintings on palm leaves, Bomkai saris, stone crafts and shell work, silverware and brassware, you cant stop looking at the splendid variety. The main areas to shop for Puri's specialties are near Jagannath temple, Swarga Dwar, New Marine Drive Road though local markets in the city offer almost all that one demands from the city. Air : The nearest domestic airport to the city is in Bhubaneshwar connecting the city to the International Airports in Calcutta and Delhi. Rail :Puri Railway Station is a major station of the state and is well connected to important cities of the country. Road :An excellent network of roads makes it available to travel to various destinations in and around Orissa.